This workflow merges output from all service layers to calculate the usage data for your specific BIG-IQ registration key every 180 days (default setting). However, you can also run a complete historical report. After running the billing report, send F5 the report in an email. Before executing the Generate Report workflow in your VNFM, you must start and run your BIG-IQ instance. 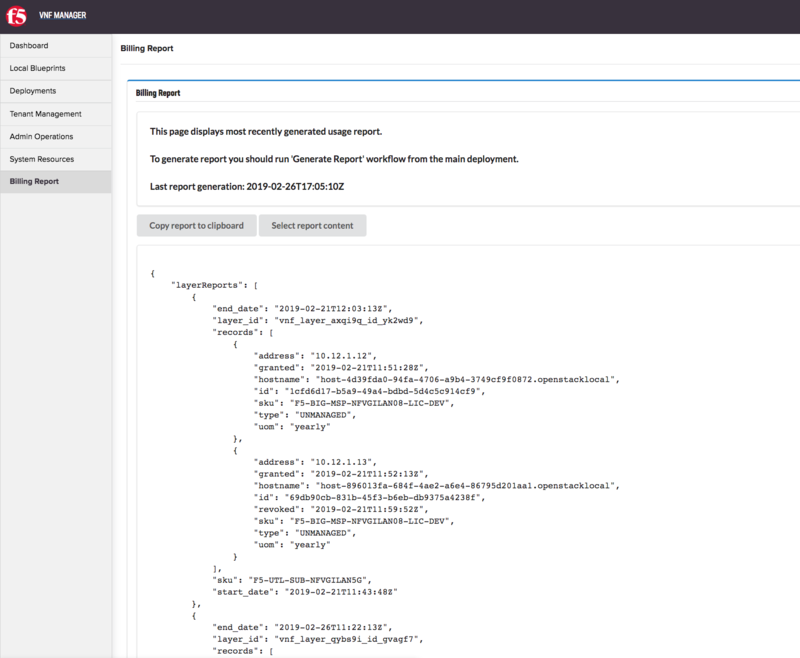 Generate utility reports on your VNF Manager only. Never manually generate utility reports on your BIG-IQ machines. In the F5 VNF Manager, click the Deployment blade. In the base deployment row (the deployment for the actual Gi-LAN or Gi-Firewall solution blueprint defined using the inputs file), expand , and select the Generate Report workflow from the list. At the Execute workflow generate_report popup menu, leave the false default value in the full_historical_report text box, and then click Execute. A report will generate for the last 180 days of utility use. If you want to run a complete historical report, change this value to true. Once you generate the report, in the left menu, click Billing Report. The Billing Report page displays recently generated report data. Click Select report content to select the report text, right-click the selection, and then select Copy from the menu. Click Copy report to clipboard. Paste the content into an email, and then send it to F5 Networks using the vesubscriptions@f5.com email address (listed in your EULA). A link to your EULA is located on the F5 VNF Manager download site on Centercode. The frequency of sending generated reports to F5 is based on your EULA agreement/contract with F5 Networks. To find your agreement details, point your browser to the F5 VNF Manager download login site on Centercode, and then click the EULA link. Copy and paste the report data into an email and send it to vesubscriptions@f5.com.